Now this then is Nokia’s Man-of-War and this would be a pivotal device in effort to make Nokia’s high end phones credible again. 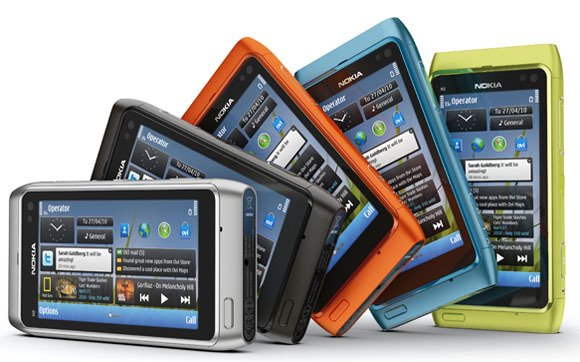 Nokia has been left far behind the iPhone, Samsung, Blackberry, Sony Ericsson and even HTC in the smartphone fight. The N97 was to address all that and more but it bombed. The N900 made a splash but not the volumes. 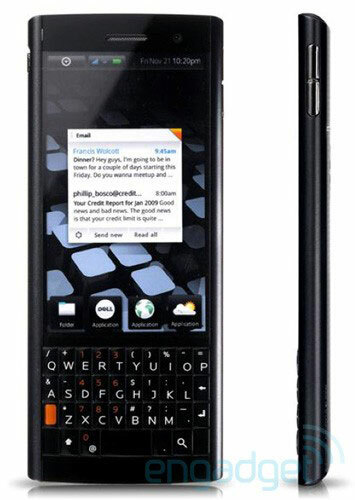 However, one was expecting more action on the Nokia – Maemo front and this one sports a Symbian 3. Symbian 3 is evolutionary not revolutionary, but then it is a key first step if it proves reliable. The absence (???) 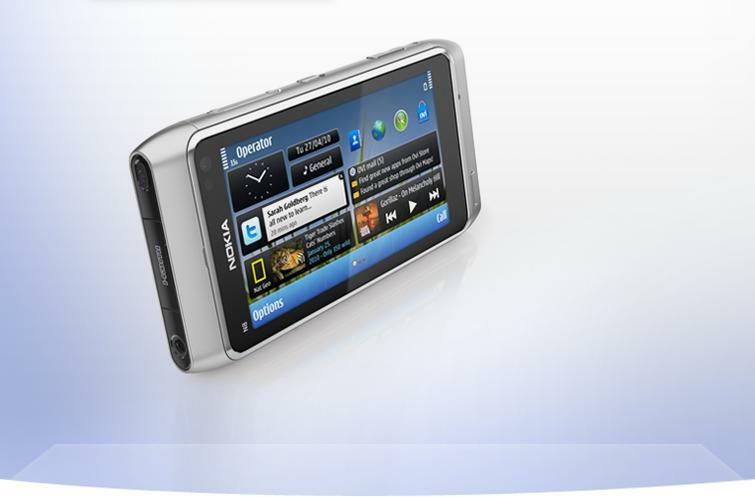 of the engine details in the Nokia product home page is confounding. If the web reports are to be believed this one sports a 680 MHz processor, which is not too bad, but simply put is not too great either. The other important factor to be considered are the rapidly surging Apps market numbers. Android and iPhone are making big numbers and one hasnot heard about much about Ovi in this space. A smartphone minus smart apps is not a smart proposition. So net of all things, Currently the N8 looks and feels good basis the features listed.. but the platform and Ovi Apps are yet to provide the edge. Nokia seems to be packing the N8 with technology and we will wait to see how it helps users do something with it in months to come. The reviews on this product are already thumbs down basis the YouTube videos and the first viewers are already drubbing this device as being slow, clunky, aweful, dreadful, blocky, really dated, not very exciting, slow and inaccurate UI, bad touch experience. Not quite the start..eh! Last year, I had blogged about Dell’s first attempt to venture into the smartphone space. The Dell O-Phone as it was then called, (possibly on the lines of the venerated iPhone) did not create any much flutter. I had seen a Chinese white box clone of the O-Phone and that is all I remember of the Dell attempt. So there was nothing to write home about of the Dell O-Phone. An year later Dell announced another 3 Android based smartphones with impressive names: Smoke, Flash and Thunder. The Smoke is a QWERTY candybar with a enterprise-business focus. It has a slim 12mm profile and runs on Android 2.2 Froyo and has 2.8-inch QVGA display, 800MHz CPU, 5MP camera, 14.4Mbps HSPA, Wi-Fi, Bluetooth, microSD card slot up to 32GB and dual-mic noise cancelling. The feature list is quite sizzling for its purpose. Smoke is expected to be released in the second quarter of 2011. 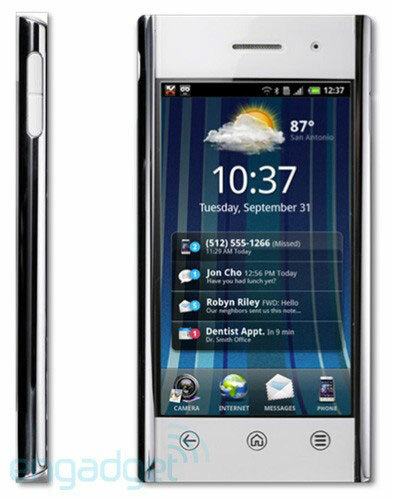 Flash, is the Touch phone from Dell running the Android 2.2 Froyo with a slim design and full touchscreen. Flash is touted to be carved out of a ‘curved glass’ and features 800MHz Qualcomm CPU, 3.5-inch WVGA LCD, Stage UI, 14.4Mbps HSPA and 5.6Mbps HSUPA, 5MP camera with autofocus/smile/blink detection, Wi-Fi, TV-out, 512MB RAM and ROM, Bluetooth 3.0, 3.5 audio jack and microSD card slot. 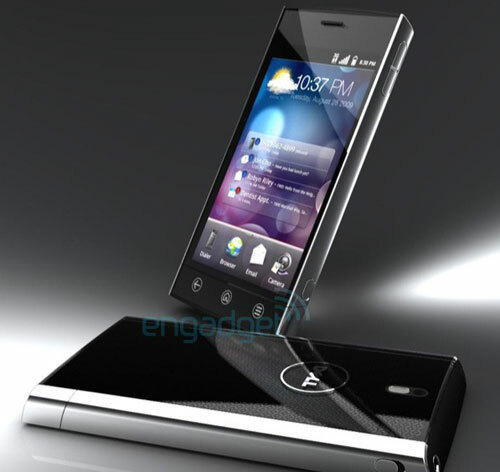 Expect this phone to come out sometime in first quarter of next year. The other touch phone rumored from Dell, Thunder features a 4.1-inch WVGA OLED screen, Android 2.1, Stage UI, 1GHz Snapdragon CPU, social networking friendliness, Flash 10.1 support, integrated Hulu app and 8MP camera. An LTE version of the Thunder is also expected in 2011. Interesting line up of smartphones from Dell but none being made available before early next year. With its initial device foray that did not cut any much ice, and these three devices that are slated for next year Dell’s smartphone efforts do not sound so convincing anymore. While India has seen a steady growth in internet usage, Penetration rates continue to be relatively low @ 24% of total urban individuals.The year 2009 saw internet penetrating lower socio economic groups (Sec C,D and E) to the extent that the combined usage in these geographies has overtaken the top cities and higher socio economic classes in numbers. Nearly 25% of Indian Population stay in cities. Out of which, 32% are PC Literate. Of the PC Literate population, 72% have used Internet. Of the universe of Internet users, 73% are actively using Internet (accessed it in atleast once in last 1 month). 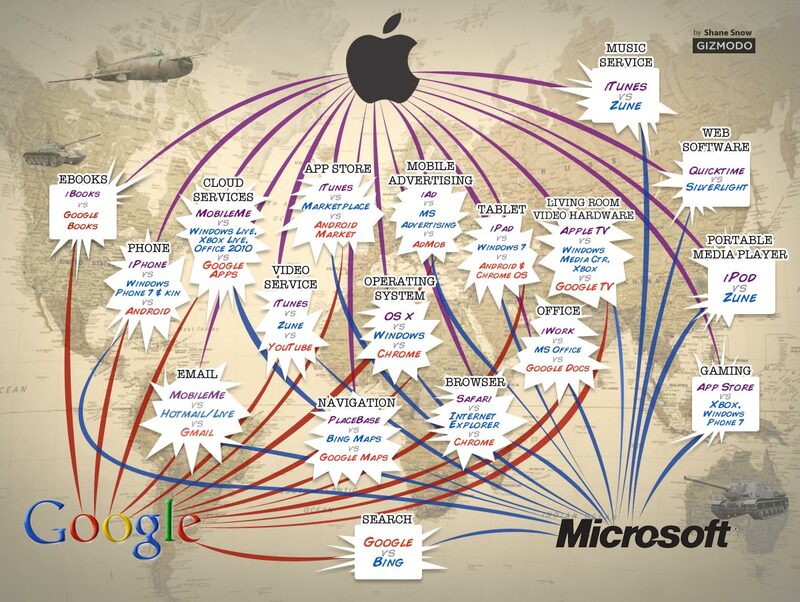 Apple, Google, Microsoft: The slugfest to the leadership of Technology industry. Microsoft was so long trying to keep everything to the desktop. Lately however it has taken decisive directions towards the cloud. Apple is all about closed information appliances tied with third-party applications. They thrive on wowing the customer on seamless interfaces through their ultra chic devices. Google wants everything from them leading to the Internet. In fact Google is trying to be the Internet surrogate. Between these three tech giants, the uture of internet and mobile communications probably lives. We will watch this space for the action as always. Digitalization of India: What the UID would mean to the common user? In an earlier post, i had written about the User Identity Program that the UPA government has undertaken with Nandan Nilekani (Ex CEO Infosys) to drive information access to the vast Indian population. This post details the UID program and what it could be doing to the life of people. 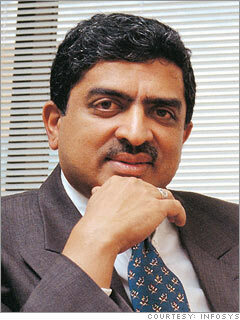 The UID would be Nandan Nilekani’s biggest project till date. •	Bank Account opening, will not require any lengthy process and the process will hinge only on the UID. •	NREGA payments will get deposited to the users bank account number by the vendor. •	AN employee will carry all his employment details on his card which can just be updated every time the employee moves office, location of organization. •	UIDs will facilitate Online tax returns and tax deductions will happen online. Thus the government will save interest amounts charged. •	The UID will facilitate shopping transactions just like a normal debit card. •	The card replaces the driving license. It would carry the photograph of the user and his eligibility in driving. •	The UID will carry all biometric information on the user in case of emergencies and accidents. •	The cards will be mandated at every property sale/purchase. It can thus be useful in tracking the unaccounted deposits and monies besides providing an electronic database of the person’s wealth. •	Government grants would also be planned in accordance of the UID records. •	All individual expenses on the government front such as electricity bill, water bill and utilities will be deducted/added on the UID. Thus the UID becomes a tool to track an individual’s activities, his income, spends, travels and other details. Given that both systems (NPR and UID) capture biometric data, the effort becomes a 360 degree tracking of the possibly 80-90% of the population of the country digitally.